Surabooks.com provides the study material of National Talent Search Examinations for class X. NTSE is National level scholarships program to identify students with high intellect and academic talent. This test their students skills in the field of Mathematics, English Language , General Language, Mental Ability, Science , Social science etc. 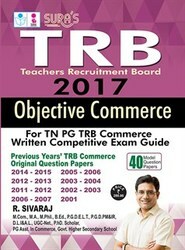 Surabooks.com provides the study material of Teacher Recruitment Board (TRB) Examinations for the candidates who prepared for TRB Exams. It contains the syllabus of Marketing, Advertising, Accounting for management, Capital Expenditure decisions, etc.